The Engine 2 Diet was created by Rip Esselstyn, a professional athlete turned firefighter, who converted a firehouse full of committed carnivores to a plant-based diet, in the process improving their weight, blood pressure and cholesterol. He developed the program when he realized that several of his fellow firefighters had dangerously high cholesterol levels. They all experienced dramatic improvements by following his eating plan. Then he applied the same principles to a group of fifty-eight volunteers who lost an average of ten pounds and significantly reduced their cholesterol levels in just four weeks. In the first part of the book Rip Esselstyn explains why he created the diet, the science behind it and how it improves conditions such as hypertension, diabetes and cardiovascular disease. Next he outlines the importance of factors such as having the right attitude, social support and creating long-term health goals. Following this he introduces the 28-day program, which consists of a diet based on unprocessed plant-based foods such as whole grains, legumes, nuts, seeds, fruit and vegetables. Additionally there are strict limits on the amounts of sodium, fat and sugar permitted. However, unlike many other low-fat vegan diets, you won’t be eating “rabbit food” because this eating plan was designed to meet the needs of physically active firefighters. The recipes are big on flavor and include foods like pancakes, tacos, pizza, pasta, burgers, chocolate brownies, cookies and other familiar comfort foods. The Engine 2 Diet meal plan is nutritionally balanced and contains adequate amounts of protein, calcium and every other required nutrient. For dieters who don’t feel ready to start the full program right away, an option is included called the “Fire Cadet Plan” that allows you to ease into the diet gradually by eliminating dairy products, refined foods, meats and oils, one week at a time. Fresh vegetables and fruit, brown rice, oats, quinoa, whole grain bread, black beans, garbanzo beans, tofu, soy yogurt, raw nuts and seeds, avocado, flaxseed meal, nutritional yeast, vegetarian sausage, Boca burgers, salsa, sorbet, nondairy ice cream, cocoa, agave. A fitness plan is provided in The Engine 2 Diet that includes “fire-fighter inspired” exercises like push ups, abdominal exercises and squats. Rip Esselstyn recommends that each day you also should do aerobic exercise like brisk walking for 30 to 45 minutes. 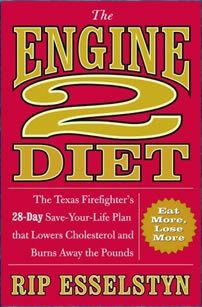 The Engine 2 Diet: The Texas Firefighter’s 28-Day Save-Your-Life Plan that Lowers Cholesterol and Burns Away the Pounds retails at $24.99. Encourages the intake of fresh produce and high-fiber unprocessed foods. Quickly leads to improvements in blood pressure and cholesterol levels. No limits on portion sizes. Includes a basic seven-day meal plan and a wide variety of recipes. Engine 2 Diet Exercise program is included. Endorsed by Dr. Dean Ornish, one of the leading heart health specialists. May be difficult for some meat eaters to start eating a plant-based diet. Requires more time for planning and preparing meals. Some dieters may need to pay attention to calorie intake to effectively lose weight. Difficult to eat out and stick with The Engine 2 Diet. Not everyone responds well to a low fat diet. The Engine 2 Diet is beneficial for not just firefighters but anyone who needs to reduce their blood pressure or cholesterol levels and lose weight. This program requires a fair amount of dedication, as the diet plan is quite restrictive, however it has been proven to produce positive results and is endorsed by a number of prominent health experts.